I went in with a list, and actually managed to keep to it pretty well! Fiber arts are a wonderfully rich field. Each fiber has its own properties, and you can prepare it in various way to accentuate other properties, then spin them in different ways to - guess what? - achieve yet more properties, and finally, you can knit/weave/nalbind/whatever using different techniques to get different results. As a beginner, it's kind of dizzying. I found Indigo Hound, who seems to be the main supplier of Viking wool combs to the world. Got a pair of double-row combs, a nostepinne from Mistress Brienne, and a plastic diz for pulling the combed roving through. Score one. The Mid-Atlantic Icelandic Sheep people were there. Not knowing how fleece was sold, and having previously bought roving by the ounce, I looked over the fleeces and chose the one that looked prettiest - a soft grey thel undercoat and a red-brown tog overcoat. The tog looked very long and the color difference meant it would be easier for me to see it to pull it out. Well, turns out you buy entire fleeces. And that's how I ended up with four pounds of ram fleece to take home. I shall call him Stinky. The vendor said that "Healthy sheep have a healthy smell," but Stinky the Ram seemed to have a much stronger odor than the ewe fleece that was there. Not surprising - even a polled male is probably smellier than a female. I feel somewhat like a n00b, buying mostly for color rather than hand feel - but I don't even know what I'm looking for there yet. So - score two. I got some more roving - grey Romney, since the Romney I got from Sabina was so much fun to spin, and some dark brown/black Icelandic mixed tog/thel, because impulse buy. Score three and four! When I got home, I pulled off a little piece of Stinky to see how it was to comb and spin. Initial results seem promising! The thel handled like any other roving and should spin up fine. The tog was trickier to manage, like the long-staple flax was. I am hoping once I put it on a distaff, it'll be easier? But there'll probably be a learning curve. It certainly makes a strong, cord-like yarn! Very much not the fluffy sort of yarn you'd want to knit a sweater with. I also stopped in at the competition displays. There was some amazing artistry there! Felted gowns, knits, wovens, an amazing sheep skull made out of felt, hooked rugs... I feel like I could possibly make a legitimate entry into the skeins competition. Might try for next year! Haven't test-driven it yet. I'll check back with a review later. That is a reproduction of a 10th century portable sundial from Canterbury Cathedral. I saw a reference to the sundial somewhere on the Internet, and quickly found that a jeweler had made a (souvenir?) reproduction in the mid 1970s. It's a little blinged out - there are tiny gemstones at the marker-dots that were just indentations in the original - but otherwise really, really accurately detailed. You put the attached peg into one of the three holes on either side. Each hole corresponds to two months of the year. Point yourself at the sun, and the shadow of the stick gives a rough estimate of time. It's thought it was used to help time prayers at the cathedral. Lookit the widdle biddle biting animal heads! This appealing design is modeled on a pair of gold earrings with garnets in the Met's collection, originally made in the fifth–sixth century A.D. They were once worn by an Ostrogoth, one of several Germanic tribes that the ancient Romans considered barbarians. This type of earring was derived from late Roman jewelry and was adopted in the 400s by eastern Germanic women. Its simple sophistication made it the most popular earring style on the continent up to the seventh century. They're being sold as "Byzantine;" I'm assuming these would be Frankish versions of the Empire's latest fashions, or else imports. Also, caveat emptor - I don't have a picture of the original find, and "based on" in catalog-speak can mean anything from "close copy" to "shares a similar motif, if you squint." I didn't get the stand, shown, because I ran out of gift certificate, but I may circle back around and get it when I've saved up. The last tapestry I did was tiny, and I could hold it on my lap, propped on the edge of the table. A 27" frame (for 25" of weaving) is a bit bigger! Still, I'll see how it goes without a holder first. How about I just buy a Panther Hunter tent? It says it's for fur trade re-enactment, but put a gold ball on top and it looks just like the ones in the Utrecht Psalter, I think. There should be a zone about 3' around the center pole of the 10' x 10' x 8' model that's 5'5" and higher, which is enough to stand comfortably and get dressed. Storage boxes of a reasonable size can get to within a foot or so of the perimeter, making good use of that space. It goes up fast, can be set up by one person, and is overall looking pretty awesome. I wonder if they'd make the 8' upright into a split pair of 4'ers? That'd help with packing. Although it shouldn't be too bad to tie the sucker down to the roof of the car. I learned about the Överhogdal tapestries a few days ago. I also found that there is a wee slight (16 pp) book about them, in an English translation, and that said book could be had from a West Coast rug-focused bookstore. (They bid me greetings from the West Kingdom in their acknowledgement of my order, recognizing the "sca" in my email address, evidently!) It came today. It gives some really good, useful information on how these tapestries were made. At first, they were thought to be embroideries, but since the wool design threads never pierced the underlying linen base, they were reclassified as soumak embroideries. Now, I suspect there's a really good chance they were soumak tapestry-woven. But you could create a structurally identical piece if you had a linen embroidery fabric and a blunt tapestry needle - going through the holes of the fabric carefully. EDIT: *headdesk* If you're interested in these tapestries, get a much more detailed book for less than I paid for my new loot over here. I'd never been to the Sheep and Wool Festival before, the first weekend in May having long been a family reunion weekend. This year, the schedule changed, and the husband and I got to go. 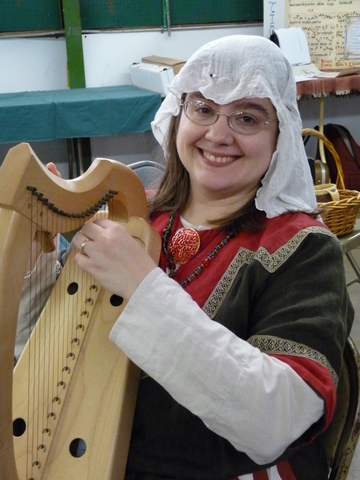 It was Pennsic for sheep. Hugely crowded. The parking lot filled up, and then three overflow parking lots. There were county cops directing traffic. Bigger than the county fair. Amazing! I realized I had no idea what I was even shopping for. I felt like I still didn't know enough about what I want to do, fiber-wise, to make any purchases. (And wasn't I supposed to be focusing more on bardic, anyway?) I still walked out with two skeins of yarn in natural cream and brown, two "fat quarters" of hand-woven wool chevron twill fabric, and some lanolin hand cream. The fabric is destined to be the new and upgraded Harley MS bag. The wool is... uh... well, I try not to buy stash stuff without a project in mind, but felt like I couldn't turn this down. I'll make some sort of tablet-woven band (trim? strap for new bag?) out of it, probably. Maybe... maybe?... trying a double-faced twill pattern. Speaking of wool. I found this video on warping the "toy" Beka rigid heddle loom I have. (Mine isn't even the 10", it's the 4". Good for belts, leg wraps, not much else.) I tried it, and it was much easier! So now I'm set up to do 5-6' of 2" wide dark grey wool, 10 ends per inch. Not sure what that's good for, but I'll have plenty of it to find out. And speaking of what I'm up for (this post just keeps growing)... I realized that I have no idea. I thought I'd leave the festival with at least a drop spindle. But do I really *want* to spin? Or do I just think that it's something I 'might as well' or 'should' do? It doesn't seem like something I'd enjoy, but I thought that about hand-sewing, too.